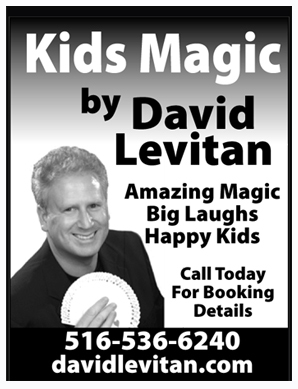 Kids Magician David Levitan has a superb rapport with young audiences. 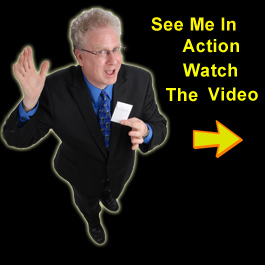 His magic show creates a friendly atmosphere where the children posses the magic power. Together the children and David whip up a whirlwind of amazing magic and sidesplitting comedy. Through the use of world class sleight-of hand and incredible timing your children will be mesmerized with Magic, Fluttering Birds, Unique illusions, Juggling and Tons of Audience Participation. It’s a blast! The kids are the real stars of the show! They will go home raving about your event. Thanks to you and Trademark Special Events our Family Day was a huge success--it has been the talk of the office for over a week. I've received numerous calls, messages and lots of e-mail with comments on what a wonderful day it was and how there was something for everyone to enjoy. I have even heard from some non-attendees--wishing they had been there after hearing about how much fun was had by all. Being a photographic company, we've displayed a few hundred of the "best" pictures for all employees to see--they bring smiles to everyone's faces. When we started planning Family Day last June, we contacted several vendors. Most proposals we received were fairly similar but Trademark's was clearly different. It was more creative and quite aparent that youhad put more thought into your ideas by focusing on the entertainment portion. Not having worked with Trademark before, I was a little skeptical, but it's obvious we made the right decision. Every member of your staff was courteous and a pleasure to work with you and your performers were extremely talented and funny. The children (and the adults) really enjoyed the Juggling and Magic Shows. And,absolutely everyone loved the Hawaiian Dance Revue--they were phenomenal. My deepest thanks to both you and Jodi for genuinely caring and going out of your way to help fill our Family Day with wonderful memories. You better start thinking about ideas for next year's theme--for we will surely be calling upon the experts at Trademark Special Events. "World of Magic" in our library's new space. Children are generally a great audience, but I have never seen them react to anyone as they did to David. His show was nothing less than hilarious. The children were screaming with laughter, the adults not far behind, and I joined in with the kids! David had us all in the palm of his hand-he even had us calling out in unison the responses he wanted from us. We were swept along on a wonderful ride. his humor and magic were seamless. Technically, the show was easy to accommodate and David was a pleasure to work with. He is absolutely hassle free for any coordinator. It is a joy to work with a calm professional. To anyone who is considering booking David, I can only say that I have rarely seen an audience so happy, or been more entertained myself. On behalf of the Wildlife Conservation Society, I want to extend our heartfelt gratitude for your participation in our Boo at the Zoo event. Without your magic shows our event could not have been the success that it was. Consistently drawing large crowds, your magic shows undoubtedly enhance our visitor's time here at the Zoo. Despite harsh weather conditions, our visitors came in droves to your magic shows. Through the use of optical illusions and slight of hands, you left the children in the audience filled with wonder. Our mutual goal of enriching children's lives was fulfilled, and visitors left the magic shows amazed. The professionalism of your magicians in dealing with our visitors is to be applauded, and demonstrated a commitment to excellence and their craft. We thank you for all the hard work you have put in, and we look forward to working with you in the future! Many thanks to you and your wonderful performers for the fabulous show you put on at HBO's Family Day event last week. Each year you seem to outdo yourselves! And David, I finally had a chance to catch your magic show and i can see why the children were enchanted. As for your performers, each one has individual talents but all are sweet, friendly and charming. The children loved them all.... It was a pleasure to work with you and your professional staff. Thanks for helping to make our day more special, and I look forward to working together again in the future. Thank you so much for the fantastic job you did at our Children's Holiday Party. Your enthusiasm and great sense of humor created a magical atmosphere for us all. I particularly loved the transfer of nose taps you performed on our coworker and her husband. I still don't know how you did that! Our whole family at Ikea was amazed by your show. You are wonderful and I am so happy that we have had you so many times. Thank you again. David is known by many monikers including: the Best Long island Kids Magician, The Funniest Kids Show Perfomer, The Best Camp Magician, Best Birthday Party Magician, Best New York Kids Magician, Best New Jersey Kids Magician, and the Best Westchester Kids Magician, The Best School Magician and the Bronx Zoo's Boo at the Zoo Magician. Let him create his best for you.